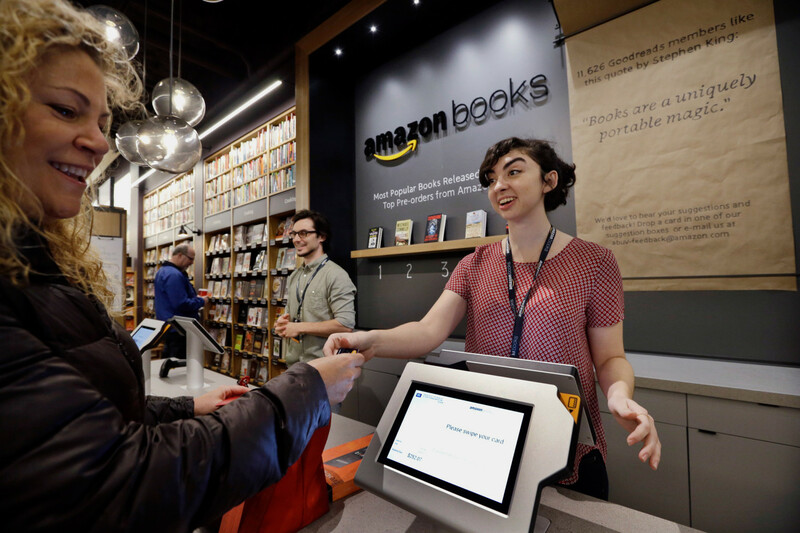 Amazon's New Store May Bring Bookstores Fierce Competition! Amazon opened a first ever store front, Tuesday November 3rd,2015 early in the morning. Watch out Barnes and Noble! New competition may be coming! Amazon opened a first ever store front, Tuesday November 3rd,2015 early in the morning. This store is located via University Village, found in Seattle, Washington. The new storefront comes equipped with 5,500 sq feet of customer and retail space plus an additional 2,000 square feet in stockroom space! This can make it easier and more convenient to store more books that may be the latest and “greatest” and current trend. A Happy customer checking out at the new Amazon Store Front in Seattle, Washington! What exactly makes this store so competitive against Barnes and Noble, or other book retailers? The answer is simple. Unlike Barnes and Noble where there is new and not so popular books, the amazon storefront, focuses on customer demands, and their most wanted books, as well as the hottest and most popular texts in the book market. They also focus on the books that have ratings of four stars or more! Don’t get your hopes up yet consumers as of right now there is no plan of expanding to more stores. With this new storefront, Barnes and Noble and other book retailers will need to step up their game if they want to keep up with Amazon’s strategic competition.